Encoder Host Chassis for HDE24A High Def and SDE24 Standard Def encoder cards. (Chassis only, cards are purchased separately). 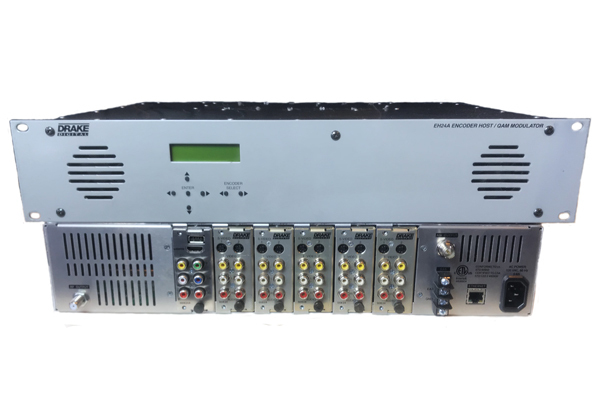 The Drake model EH24A, encoder host, is the core multiplexer, QAM modulator, up-converter, ASI output, user interface, and power supply for the SDE24, HDE24, and SDI24A encoder modules. Up to six encoder modules can be installed into the EH24A via rear panel access. SDE24 encoders can encode one or two programs, depending on whether MPEG2 or MPEG4/H.264 encoding is used (see below), per module. Typical applications are to provide MPEG video in MDUs, medical facilities, libraries, stadium video networks, private cable and other QAM applications. The EH24A may be used in Edge or headend applications. There are two multiplexers in the EH24A, one providing an ASI output stream and one providing a stream to the built in QAM modulator/upconverter. The latest firmware release provides EAS implementation and allows low speed data streams to be added to the output for purposes such as DTA channel mapping and code upload.